>Been a little over a week and Christmas out of the way, took the opportunity of the two public holidays this week to fit in a couple of lessons. Yesterday was medium turns. Back with Adam again and in VH-IGX. Did the usual pre-flight briefing. The air exercise is for straight and level 30 degree turns, then climbing turns, followed by descending turns. Out of the box was pretty much the same as usual. However I had duty for all radio calls. Hmmm. Was a bit “how your going” with the read backs. On taxi clearance I read back the time, rather than the runway, oops. Adam was quick to correct it. So to help get more familiar with radio calls, I thought listening to some radio chatter would be cool. On the net, the website LiveATC.net provides access to a bunch of radio feeds. Australia has pretty good coverage, but even better, Jandakot is online. The Jandakot feed provides Perth Radar, Jandakot tower, Jandakot tower for circuits and Jandakot ground. Pretty good coverage if you want to get some familiarity going. Anyway, the website is good, but they have an iPhone app which is alot better. You can take ATC with you on the go and listen through your ear plugs anywhere that tickles your fancy. On the bus, driving along etc. I’ve just added a page for the Best aviation apps for iPhone, iPad and iPod touch. The details for the iPhone LiveATC and a few tips can be found there. Anyway, the turns. They were good fun. We started out by doing an “S” type manoeuvres to get used to turning in, getting balanced and then exiting the turns. All good. The turns were done as full 360s. Left was good, but my right turn was rubbish. Lost too much altitude. Tried again and it was a bit better. The direction change requires a small nose down, turn in, keep balance and then back pressure to get the nose up to maintain the height. Here are some GPS maps of the flight. These were created using my cycling computer, a Garmin 305. 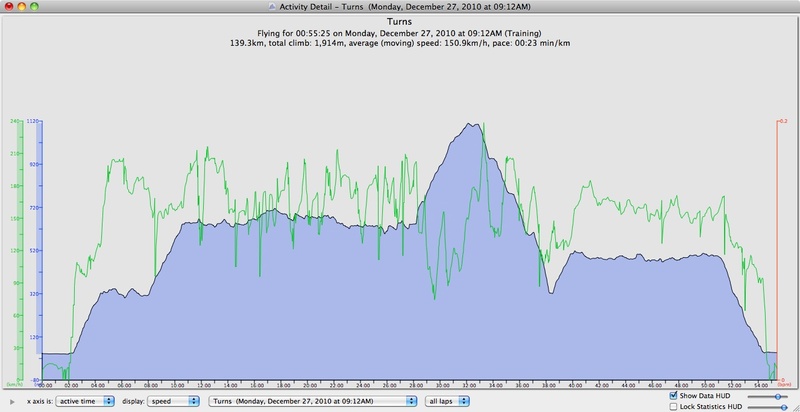 The images are then generated by the Mac software called Ascent, which I use to track my cycling efforts. This entry was posted in ascent, cessna 152, descent, GPS, Jandakot, map, Pilot License, turns. Bookmark the permalink.